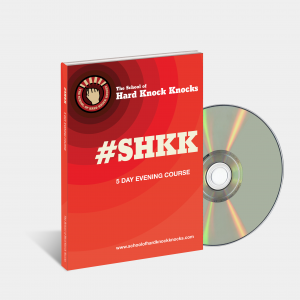 THE SCHOOL OF HARD KNOCK KNOCKS (SHKK) 5-evening stand-up comedy course runs from Sunday to Thursday, 6.30 pm to 9.30 pm, from October 21 to 25, 2018. 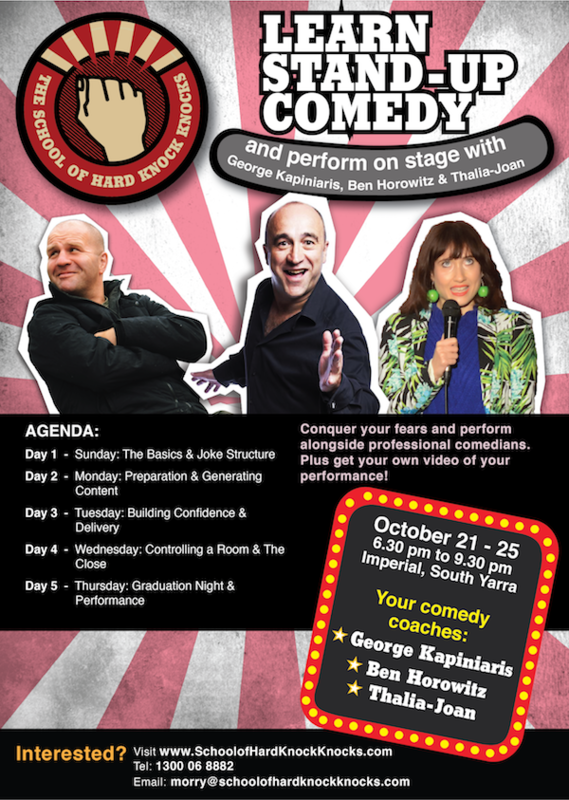 You’ll get the SHKK comedy manual, video of your graduating performance, and lots of coaching from a 17 year veteran of the comedy circuit, Ben Horowitz, and celebrity comedian, George Kapiniaris! Learn to write a strong open to your comedy set. 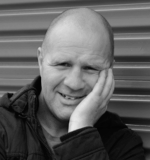 Tonight students will also have the opportunity to refine some of their own writing, plus learn about the open mic scene with our guest, Paul Sharplin. The moment you have been working toward! Perform your stand-up comedy routine in front of family and friends, conquer your fears and perform alongside Ben Horowitz, and two other professional comedians, to a paying audience. Plus receive a video of your performance! Movies, theatre, TV soap operas & drama, and of course, stand-up comedy. George Kapiniaris has done it all. And he’s been influencing Australian culture in the process. Best known for writing and acting roles in ‘Wogs out of Work’, which debuted in 1987 at the Melbourne International Comedy Festival, this stage show launched his TV comedy career in a show by the same name. 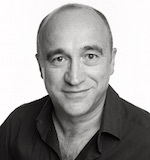 George’s next TV success was writing and performing in another comedy TV show, Acropolis Now. This show won his fellow performer, Mary Coustas, the 1993 Logie for Most Popular Comedy Performer for her role as Effie. 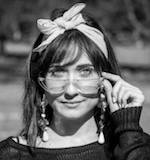 Sydney-based comedian, Thalia-Joan, is our returning alumnas for the October course. Thalia-Joan is a regular on the comedy scene in Sydney, and run her own Monday open mic comedy room, The Argyle Comedy Club. This year, she also appeared in the show, ‘Is This Thing On?‘, and has performed alongside comedy greats, including Glynn Nicholas and Greg Fleet.